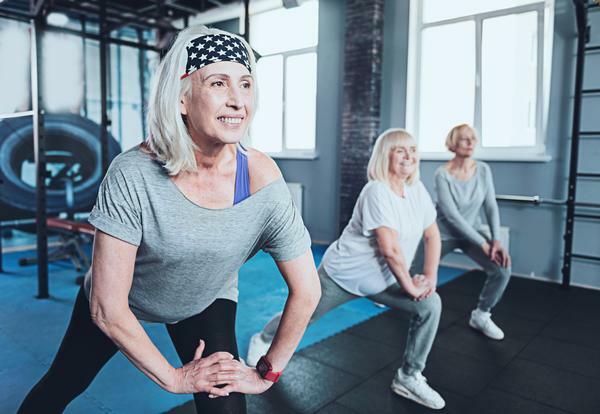 Functional training has its roots in rehabilitation, with the term first used back in the 1990s, when exercises that mimicked real-life situations and activities were used to help patients return to pre-injury level as quickly and safely as possible. Studies now show that, as well as greatly increasing the speed of recovery after surgery, improved health prior to a major operation hugely reduces death rates. ERAS+ (Enhanced Recovery After Surgery+) is a Greater Manchester-based lifestyle programme, designed by senior NHS health care professionals alongside GM Active organisations, working closely with patients who have had major surgery. One year on from implementation, ERAS+ patients saw a 50 per cent reduction in post-operative pulmonary complications such as pneumonia and their length of hospital stay following major surgery reduced by three days. 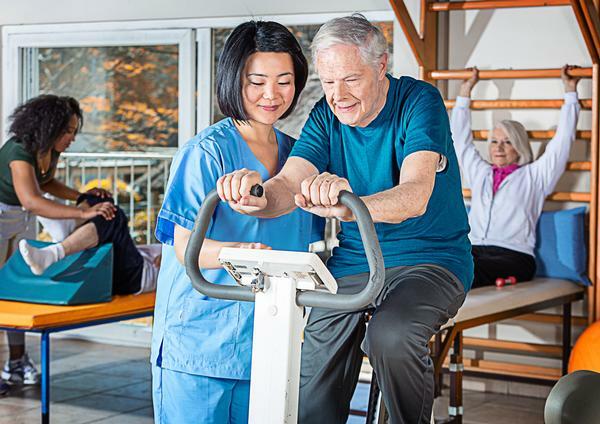 Trafford Leisure’s referral programme enables NHS consultants in South Manchester to refer patients to their centres, where a personalised exercise plan is developed to improve the patient’s health pre-surgery and support post-surgical recovery. 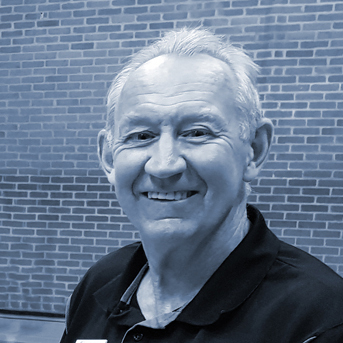 Ian Sherriff, 67, is the organisation’s Activity Health Referral expert, specialising in cancer rehabilitation at Sale Leisure Centre. 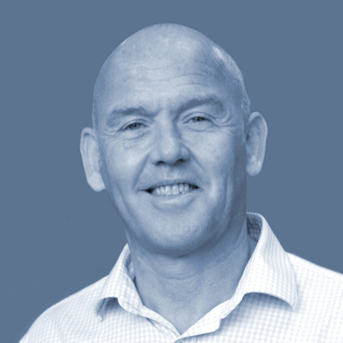 Passionate about pre- and post-surgery exercise regimes and overall good health in the over 60s, Sherriff develops functional exercise programmes for referral patients, using everyday situations to get customers moving again. From bending down to touch the toes, helping someone do up their shoes, to stretching arms up while holding small weights – replicating reaching for a high shelf – Sherriff believes the legs and core are the most important muscle groups in functional training. He uses squats and lunges to work both these groups and also to improve balance. “It’s fundamental stuff, but absolutely essential,” he says. “Customers with health- or age-related problems are often very sedentary, so I have to think carefully about how to apply functional training in light of their restrictions, for example, when teaching exercises from a seated position, crouching over and moving the legs inwards gives a similar effect to a sit up. “We also practice standing up and sitting down, and going up and down stairs. A success story for me is getting someone independent and giving them a second lease of life. 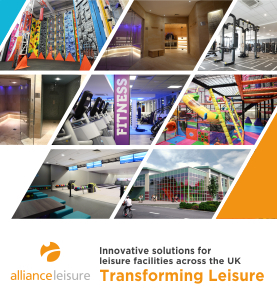 Hutton Moor Leisure Centre’s £2.15m transformation back in 2017 included a two-storey extension for its fitness facilities, with a large, freestanding Queenax functional training rig. 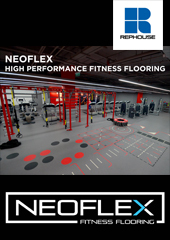 Workouts done on the rig in the first floor studio form an integral part of the rehabilitation programmes undertaken at the gym. 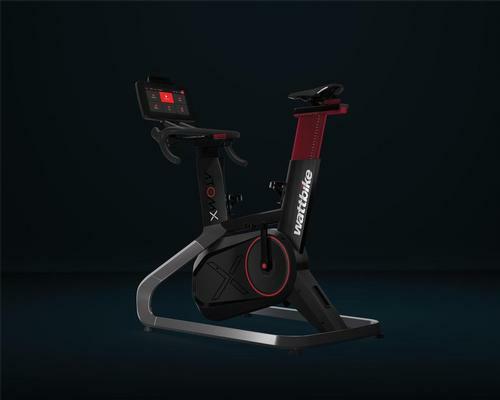 Dave Somers, North Somerset GM for Parkwood Leisure, which manages the centre, says: “A lift gives injured or wheelchair-bound members access to the Queenax studio, enabling them to do their workout in privacy and focus on the exercises without distractions or other members wanting to use the kit. 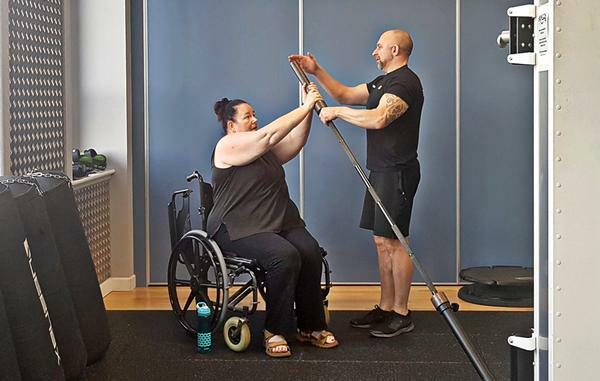 Hutton Moor has been using the studio to support a wheelchair-bound member who weighs 24 stone and has a spinal injury from a swimming pool slip when she was coaching many years ago. 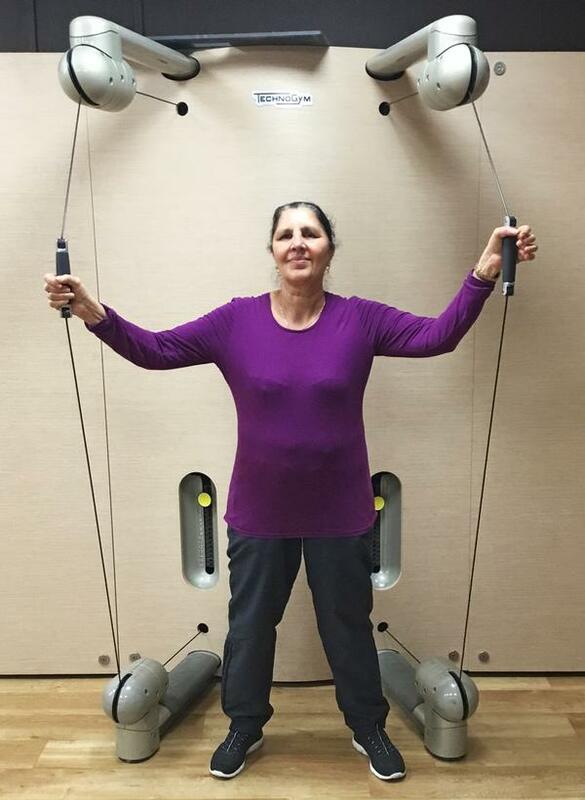 Somers explains: “The exercises she can do are extremely limited, but using the rig enables her to complete movements she would otherwise be unable to achieve. For example, using the ladder to assist with pulling herself up to standing and lowering back down to seated, and strengthening her biceps by holding the suspended bar for pull-ups. “Core strength and hand-eye co-ordination is improved by positioning the chair directly in front of the rebounder and then throwing and catching a 4kg ball. “Rotating and touching the ball on each of the chair’s wheels promotes general rotational movement. Strength from using the bands (pulling and pushing actions) combined with being seated on a Swiss Ball helps with core engagement. “The space underneath and around the rig allows our staff to safely transfer her from her chair when required, but still gives us plenty of room to work on all the exercises. Oldham Community Leisure (OCL) launched the Stroke Association’s new “Moving Forward After Stroke” programme last Autumn. 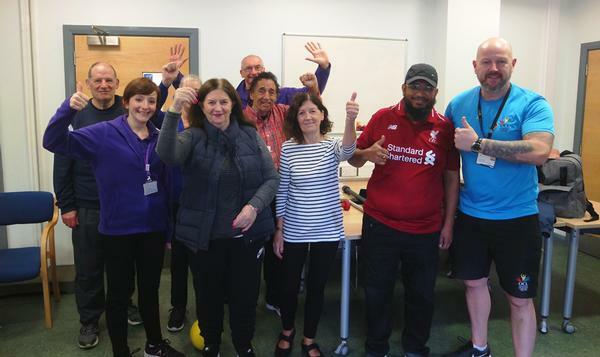 The 13-week programme includes an initial assessment, as well as mid- and end-point reassessments and 10 two-hour sessions focused on using functional fitness to help stroke survivors become more active and improve their daily lives. 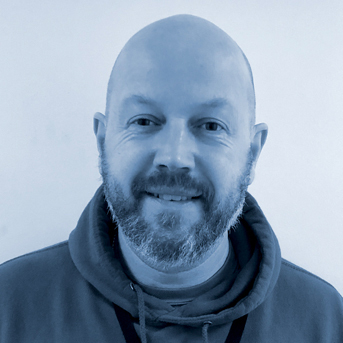 OCL’s health and wellbeing officer, Jason Bailey, says: “We use functional kit like free weights, chairs, sponge balls, step boxes and Dyna bands to help the group work on sit-to-stand movements, lifting things and putting them down again, climbing stairs and simply being able to walk further. One of the measures used to assess the participants’ progress is a timed ‘up and go’, and a 10-metre walk, carried out both at the beginning and the end of the programme. “All participants assessed improved their times and also, in two cases, were able to walk unaided, having needed supporting sticks initially. “There was also a notable improvement in every participant’s balance and confidence,” says the Stroke Association’s support coordinator, Eamonn Greene. Failsworth grandmother Margaret Clarke, 66, attended the sessions following a stroke in June 2018, which left her with weakness in her right side. Another participant, David Scholes from Shaw, Oldham, says the programme “brought him out of his shell”, while Sheila Bidolak of Chadderton says just attending the group was an accomplishment, as she wouldn’t normally go anywhere on her own.